In March 2008 penguins came ashore at the lagoon covered in oil; a minor oil spill had occurred leading to the death of a small number of Gentoo penguins. Falklands Conservation staff tried to clean them, but to no avail. The rescuing of penguins after the more serious inshore Ocean 8 oil spill was more successful, with Falklands Conservation returning cleaned penguins back to the wild. This spill was dwarfed by the major oil catastrophe in the Gulf of Mexico. They all highlight the need for protection of the marine environment and wildlife of the Falkland Islands from man-made disasters. 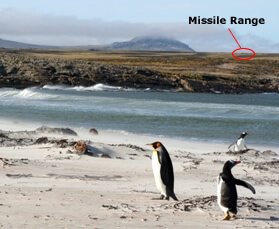 The defence of these islands following the Argentine invasion in 1982 and the subsequent war rightly remains a high priority for the Falklands government. 1. A no low-flying zone was placed over the lagoon and East Island. The no-fly zone has been breached. The worst in 2009 a jetfighter flew very low over the Lagoon and scattered the Gentoos and our guests in all directions. Luckily the Kings, which were all incubating eggs, were determined to stand firm and not be swept away in the tide of terrified Gentoos. The Commander of the British Forces apologised publicly and as a result of this incident the “no low flying” zone was increased in size. We hope that this will never happen again. 2. 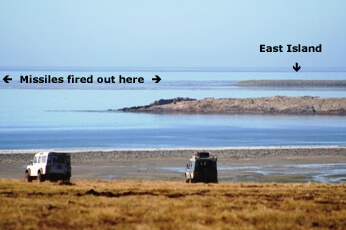 The missile firing arc was moved eastwards to avoid East Island. This island is covered in tussac grass and is a major fire risk. A number of other tussac islands have been destroyed by fires caused by man. When we watched a batch of five missiles being fired, two of them malfunctioned and went out of control. 3. Environmental monitoring of firing is now in place. However we are concerned, as the environmental monitoring is somewhat shaky. 4. Missile firing is prohibited in November, December, January, February, and March in order to protect breeding birds and other wildlife. Firing of missiles has been taking place in these prohibited months, most recently in November 2017. We remain concerned about the lack of communication and the lack of compliance. We are alarmed that in the future the disturbances may increase driven by the needs of the military and privatised companies to carry out weapons training and testing. The recent purchase of Israeli armaments could lead to further pressure. We fully appreciate the need for training and like everyone in the Falklands we are hugely appreciative of the sacrifices the military made in the 1982 war with Argentina; they gave us back our freedom. We only ask that this range be moved to somewhere on the Islands less damaging to the wonderful, but vulnerable, wildlife at the Lagoon and on East Island.